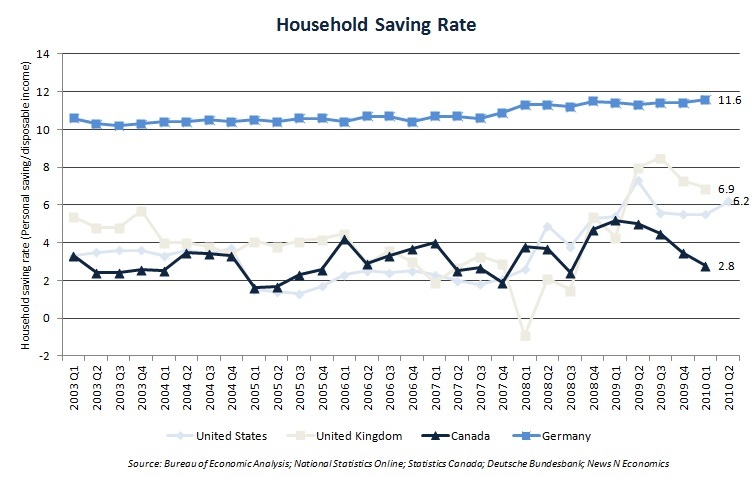 News The German Model Economy: A Lesson for U.S. Manufacturing? The German Model Economy: A Lesson for U.S. Manufacturing? Much has been written of late about the loss of manufacturing jobs in the U.S. Statistics show that the U.S. has lost over an estimated 3.0 million manufacturing jobs since 2000. Politicians, pundits and businessmen attribute the loss to several factors: a flight to low-wage countries, unfair trade policies by foreign governments, stricter U.S. environment regulations and lack of clear-cut policies in the U.S. to support and enhance manufacturing. Suggestions to improve the situation in the U.S. have included tax incentives, government support for R&D, increased valuation of the Chinese yuan, looser environmental policies and “Buy America” initiatives. But manufacturing in at least one country – faced with the same global competitive issues as the U.S. – appears to be thriving. Germany’s trade and current account balances are positive, and demand for its products is strong. The IMF estimates that Germany will have an account surplus of 5.5% of GDP in 2010, close to China’s 6.2%. 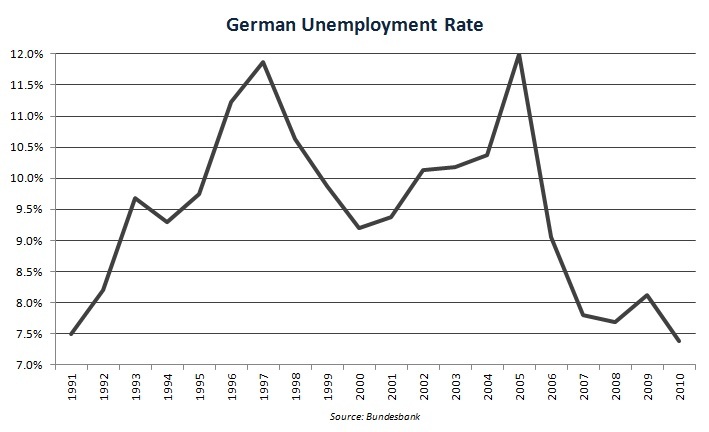 Its unemployment rate is at a 20-year low, reflecting efforts to address the economic challenges that plagued the country after reunification. Today, German manufacturers are reporting labor shortages. Some of this success can be attributed to a reduction in real wages from 2000-2008, while real wages grew in other developed countries. In addition, the German economy benefitted from a material increase in both temporary and part-time employment which resulted in a more flexible workforce. However, Germany sustained strength in the manufacturing sector despite (or possibly because of) a high national savings rate and without significant monetary or fiscal stimulus. These factors were shared by many of these companies. Specialization: These German companies concentrate their resources on niche market segments in an effort to dominate them worldwide. These manufacturers aggressively pursue emerging markets. Their target segments are well-defined, and their products are focused on meeting the needs of those segments. Breadth of one’s product line is not a priority. Innovation: Continued improvement in products and processes is critical. These companies commit significant resources to research and development. They tend to focus on traditional manufacturing sectors (e.g., industrial machinery and components, medical instruments and automotive parts) where technological breakthroughs are rare. Thus, even incremental innovation creates important positive product differentiation. Strong Customer Service: These German manufacturers are very close to their customers – especially their top customers. They are intimately aware of their customers’ needs and have a robust after-sales service orientation. They tend to sell on value not price and, as such, their goods appear to be less price-sensitive than those manufactured in other developed countries. Flat Organizational Structure: Management behavior is typically predicated on flat hierarchies and informal channels of communication, which reflect the personal styles of the businesses’ owners. This leads to a high degree of mutual trust and loyalty between management and employees. These companies possess strong corporate cultures coupled with excellent employee identification with their employers. In addition, their leaders possess strong characters and have long tenures with their companies. Professional Management: Family-owned German firms are more likely to employ outside professional managers in leadership positions than firms in the U.S., the U.K. and France. According to research by Venohr and Meyer, approximately 60% of family-owned companies in Germany hired outside professional managers. In the U.S., the U.K. and France only 30%, 23% and 31%, respectively, hired outside professionals. Operational Excellence: Most of these companies employ state-of-the-art lean manufacturing practices. They strive for operational effectiveness, continuously assimilating, attaining and extending best practices. They pursue aggressive cost management, including selective off-shoring of lower valued-added activities. Target setting and performance management are critical. These companies rely heavily on their own strengths. They do not rely on strategic alliances, and few are involved in large acquisitions and other risky game-changing strategic moves. They also prefer to minimize the use of outside financing to capitalize their businesses. Former U.S. Commerce Secretary Carlos Gutierrez noted that the U.S. has tended to retain the manufacturing of items that are complex to produce – especially in high-tech industries such as medical devices, aerospace and pharmaceuticals. These industries require continuous research and development and demand specialized skills and training. It appears that German manufacturers have applied this same commitment to continuous improvement to a much broader array of products and industries. By applying the same principles, U.S. manufacturers can identify business opportunities that will allow them to compete globally. The adoption of the focus and business practices of their German counterparts could help drive a sustainable advantage. With innovation as the historical mainstay of the US economy from its inception, a reinvigorated U.S. manufacturing sector is a realistic and attainable objective – given time and commitment. About InterOcean: InterOcean Advisors LLC, based in Chicago, Illinois is a boutique investment bank serving the manufacturing sector. InterOcean provides merger and acquisition and capital raising advisory services to middle market manufacturing companies in the metals, automotive, aerospace & defense, capital equipment, building products, plastics & packaging, medical devices and distribution/business services sectors. About Lampe: Lampe Corporate Finance GmbH, based in Frankfurt Germany, is the investment banking subsidiary of the German private bank Bankhaus Lampe. Lampe provides merger and acquisition, capital raising and strategic corporate finance advisory services to German and international companies in domestic and cross-border transactions. InterOcean Advisors LLC and Lampe Corporate Finance GmbH are members of the GEB International M&A network.